What Worked With Obamacare? Lessons From 5 States : Shots - Health News A look at how five states' Affordable Care Act exchanges fared shows that more populous markets had an easier time keeping prices down and offering a choice of plans and providers. 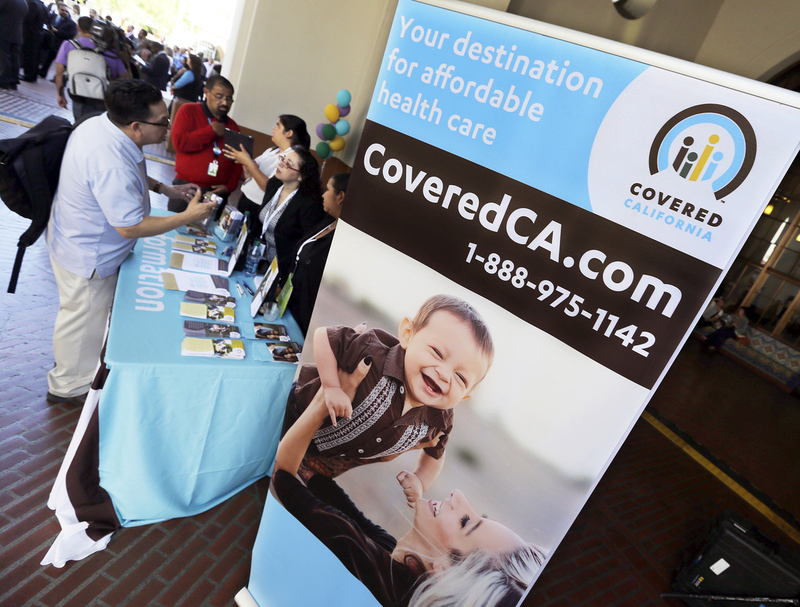 People sought out information about buying health insurance through the California exchange at Union Station in Los Angeles in 2013. Ask anyone about his or her health care and you are likely to hear about doctors, hospitals, maybe costs and insurance hassles. Most people don't go straight from "my health" to a political debate, and yet that is what our country has been embroiled in for almost a decade. A study published Thursday tries to set aside the politics to look at what makes or breaks health insurance markets in five states. Researchers from the Brookings Institution looked at state markets, thinking that if the goal is to repair or replace the Affordable Care Act with something better, then it would be good to know what worked and what failed. "The political process at the moment is not generating a conversation about how do we create a better replacement for the Affordable Care Act," says Alice Rivlin, a senior fellow at the Brookings Institution who spearheaded the project. "It's a really hard problem, and people with different points of view about it have got to sit down together and say, 'How do we make it work?' "
The researchers looked at California, Florida, Michigan, North Carolina and Texas, interviewing state regulators, health providers, insurers, consumer organizations, brokers and others to understand why insurance companies chose to enter or leave markets, how state regulations affected decision-making and how insurers built provider networks. "Both parties miss what makes insurance exchanges successful," says Micah Weinberg, president of the Bay Area Council Economic Institute, who led the California research team. "And it doesn't have anything to do with red and blue states and it doesn't have anything to do with total government control or free markets." Insurer competition varied widely within states, with the most dramatic differences between urban and rural areas. The more populated regions tend to have more insurance competition and better-priced plans than rural areas. Fewer people live in rural areas, which means there are fewer hospitals, doctors and other health providers. As a result, insurance companies that do business in those regions have less power to negotiate prices with local providers, who are more likely to be the only game in town. "Insurance companies don't make money [in many rural areas] because they can't cut a deal with the providers that will be attractive to the customers," Rivlin says. "And there just aren't very many customers, so it's not obvious what to do about that." Republicans, including the Trump administration, have suggested that the sale of insurance policies across state lines is one way to boost competition. But that may be easier said than done, Rivlin says. "The insurance companies would still have to have local providers," she says. "So a company in New York can't easily sell in Wyoming unless it has providers lined up in Wyoming." Consolidation includes hospitals buying physician practices and large medical centers, and big hospitals buying up smaller hospitals. California offers a prime example of this. In the San Francisco Bay Area, where consolidation has reduced competition among hospitals and physician groups, consumers have fewer choices and higher premiums than those in Los Angeles, where consolidation hasn't yet gobbled up so many providers. Insurance companies did not have any idea who would buy policies through the exchanges in the early years. And as it turned out, a lot of those previously uninsured sick people — more than insurers and policymakers had expected — raced to get coverage. As a result, researchers found, many plans incurred losses, with some companies reporting claims that were 50 to 100 percent greater than the premiums they collected. Making matters worse, a mechanism in the health law to reimburse companies for such losses in the early years proved inadequate. That caused a lot of them to leave the marketplaces. Under Obamacare, insurance companies could no longer deny coverage or charge higher rates to those with pre-existing medical conditions. And during the first two years of the exchanges, insurers simply didn't know how to price their policies because they'd rarely dealt with people who hadn't been insured before, the researchers found. In Michigan, six of 16 insurers withdrew. And in regions of Texas and North Carolina, which had between five and nine insurers, only three remained. Three of the states — Florida, North Carolina and Texas — reported that generous special enrollment rules allowed many consumers to delay enrollment into a plan until they needed health care. And in Michigan and North Carolina, researchers found that some people signed up for a policy, used it, then dumped it when they had received the care they needed. That ended up leaving insurers stuck with expenses and fewer premiums than they'd anticipated. "The challenge is some of the rules that were set up around the ACA made it easy to game the system, frankly," says Lanhee Chen, a research fellow at the Hoover Institution who was not involved in the study. Along with tightening the rules around special enrollment periods, Chen says he would like to see a return to high-risk pools for the sickest Americans, the idea being that removing the most costly consumers from the general risk pool will allow carriers to lower premiums for everyone else. But high-risk pools, which a majority of states operated before the ACA, are hugely expensive, Rivlin says. Another solution, she says, might be found by making sure a strong reinsurance mechanism provides payments to insurers that take on more costly customers. By the third year of the exchanges, insurers in all five states are offering more narrow networks on the exchange than the plans that give access to more doctors and hospitals. These smaller networks of providers allow insurers to give more patients to participating providers in exchange for lower prices. But it also means consumers have fewer choices when choosing providers. It's a trend that started before the Affordable Care Act, and one that appears to be taking hold in nearly every market as insurers search for ways to keep premiums down. One lesser-known chapter in the Obamacare story involves those carriers that are making enough of a profit to reduce 2017 premiums. "About half the insurers are making a ton of money on [the exchanges] and that's how markets work," Weinberg says. "The idea that there should be winners and losers in a particular marketplace is something that Republicans should certainly feel comfortable with." Researchers found that regional insurers that originally went into business to care for those with Medicaid — the health insurance for the poor and disabled — are filling gaps after insurers fled in many markets. Molina Health in California, WellCare in Florida, Community Health Choice in Texas, "appear to have thrived in the ACA marketplace environment," the study says. Rivlin says the success of these plans is likely due to their experience caring for a low-income, often very sick population. They already had well-established networks of local providers that allow them to provide care at a lower cost. As 2017 premiums went up, consumers became more willing to enroll in these more affordable, lesser-known plans. In the Golden State, which fully embraced all things Affordable Care Act, competition remained stable with 11 insurers offering coverage and only one — UnitedHealth — dropping out completely. And 2017's average premium increase, while about 13 percent, was about half of the national average. Part of California's success, Weinberg says, is due to its hands-on approach in deciding which insurers may join the market. And it got involved in negotiating the price of plans, which helped keep a lid on premiums compared with other states.